"...you’ll appreciate a production as clever, polished, and energetic as this one." Imaginative direction and bold production also characterize another West Side production of an early 1940s classic: Blithe Spirit, now running at Hillsboro’s The Vault. Unfortunately, even Bag & Baggage Productions’ best efforts can’t redeem Noel Coward’s thin, dated spoof of the 1930s spirituality scams that caught up even figures as smart as Harry Houdini and Arthur Conan Doyle. Writer Charles Condomine, determined to prove the fraudulence of attempts to connect to loved ones on the other side of death’s divide (or at least to collect novelistic details about the whole sham), invites medium Madame Arcati to conduct a seance at his home, with his second wife, Ruth, and skeptical friend Dr. Bradman and his smarmy wife along to witness the silliness. Complications ensue when the intimacy-challenged Condomine’s dead first wife, Elvira (whom only he can see) answers the summons, bringing a hidden agenda of her own. Greer, Beck and Walters in Bag&Baggage Productions’ “Blithe Spirit” at the Vault Theatre in Hillsboro. Photo: Casey Campbell Photography. The show’s initial 2,000-performance run may be credited in part to its distracting Britons from massive wartime death and destruction, and impending threat of invasion. It’s been revived and cinemized often. I realize a lot of people still like Noel Coward, and if you do, you’ll appreciate a production as clever, polished, and energetic as this one. Even my companion, who loathes Coward’s work, thought the show worth seeing just for its admirable, un-Cowardly aspects. But for me (and apparently the rest of the sedate audience on this opening weekend), it seems neither blithe nor spirited. It might have been preferable to the Blitz, but in 2018, the alleged witticisms fall flat, the clunky plot makes no sense, the characters are as unvarying as the story is uninvolving and the over-extended dialogue unfunny. While Palmer’s choice to emphasize the darker side of Coward’s chilly characters lent some needed depth and abrasiveness, it may also have scuffed away some of the sparkle that fans cherish. More likely though, whatever shine Coward’s dialogue once radiated today seems faded by time. Usually, when a classic sputters, you blame the production. But here, it’s hard to imagine what more the company could have done to invigorate a story that drags on far too long for its thin content. In fact, with a handful of exceptions, every single sporadic audience chuckle loud enough to notice came not in response to Coward’s lines — but to director Scott Palmer’s uproarious unscripted and unspoken additions, expertly executed by his team of crack B&B regulars. Seldom have so many worked so hard and so well to make a better production of a worse play. 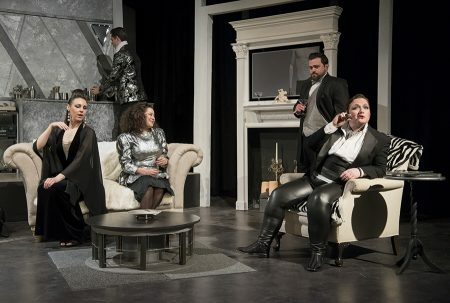 Those include Tyler Buswell’s handsome, grey-black-silver-white set design (and Melissa Heller’s complementary costumes and masterful makeup, easily visible in the intimate space); a vintage 1980s pop soundtrack that replaces Irving Berlin with The Smiths, General Public, the Romantics and other bands I’ve generally tried to forget; Palmer’s hilarious blocking, pulled off with necessary split second timing even on opening weekend; and entire silent subplots created through movement in the spaces between the lines, especially one involving Edith, an uptight maid perfectly played with side-splitting skittishness by Arianne Jacques. B&B stalwart Kymberli Colbourne adds to her sterling track record with an over-the-top portrayal of Madame Arcati as a butch, swaggering, cycling, cigar-chomping, southern-fried medium contrived from equal parts Foghorn Leghorn, Yosemite Sam and perhaps (briefly) James Tiberius Kirk. Her dazzling eye makeup alone should have received a character listing in the program. Cassie Greer, Jessica Geffen, Andrew Beck, Peter Schuyler, and Kymberli Colbourne in Bag & Baggage’s ‘Blithe Spirit.’ Photo: Casey Campbell Photography. Everyone else save the maid engages in precise upper-class Brit-speak, with Andrew Beck suitably supercilious as Charles Condomine, Cassie Greer bitingly bitter as Ruth, Jessi Walters’ increasingly petulant Elvira, and Peter Schuyler and Jessica Geffen (abetted by more Palmeristic inflection and emphasis) doing the best they can with the underwritten characters of the Bradmans. But unlike earlier Bag & Baggage triumphs with similarly unpromising material like Shakespeare’s feeble Titus Andronicus and Arthur Miller’s stolid The Crucible, neither their spot-on acting nor Palmer’s inspired direction nor the rest of this slick, scintillating production can rescue Coward’s tottering script. As the second half cranked tediously on and on despite the lack of plot interest or laughs, the peppy production insertions seemed increasingly like desperate attempts to pump air into Madame Arcati’s hopelessly punctured bike tire. Unless you’re a devoted Noel fan, even their valiant efforts can’t overcome this tired script’s Coward-ice. Bag & Baggage’s Blithe Spirit by Noel Coward runs through May 27 at The Vault Theater, 350 E Main Street, Hillsboro. Tickets online at bagnbaggage.org or 503 345 9590.